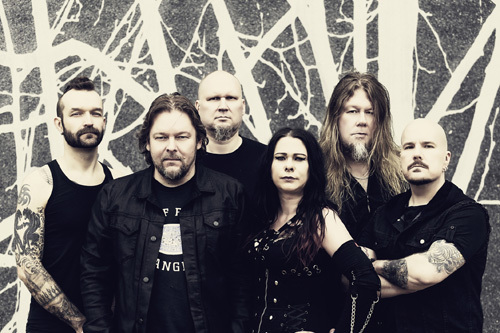 Having made the switch to a female vocalist, former Battle Beast singer Nitte Valo, in 2014, Finland's Burning Point is sticking with the decision. The Blaze is their seventh album, and the first with all new songs featuring Ms Valo at the microphone. Honestly, I wasn't all that keen on Burning Point switching to female vocals. Ms Valo definitely sings "metal," but her voice is a bit too scratchy and screamo for me. Other times, Valo simply sounds angry as within The Lie, Dark Winged Angel, or Chaos Rising. Nevertheless, her vocals seem to fit the Burning Point style of power metal, especially in combination with sharp and brisk riffage. Mostly, however, I like Valo's voice when she stops singing. 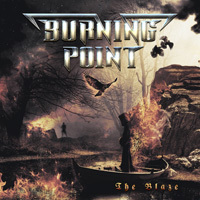 Then I prefer Burning Point's rather traditional and derivative European melodic power. The elements are there: the brisk riffage developed in twin guitar harmony, immense and satisfying leads, a galloping rhythm section, and a small touch of synths. The keyboards add some nice accents to The Time Has Come and the cover of Canadian rock singer Lee Aaron's Metal Queen, the bonus track. Not all songs are speed machines. My Spirit leans more to a metal anthem or ballad, and something like Lost In Your Thoughts develops with a solid rock groove. In the end, I enjoy Burning Point for their melodic power metal and forbear the female vocals. But if you liked the change, you will certainly enjoy their latest The Blaze. In the end, I enjoy Burning Point for their melodic power metal and forbear the female vocals. But if you liked the change a female vocalist, you will certainly enjoy their latest album, The Blaze.